CIBC Square is a two-phase office and retail development at 81 and 141 Bay Street by Hines on a site owned by SITq real estate arm Ivanhoé Cambridge. 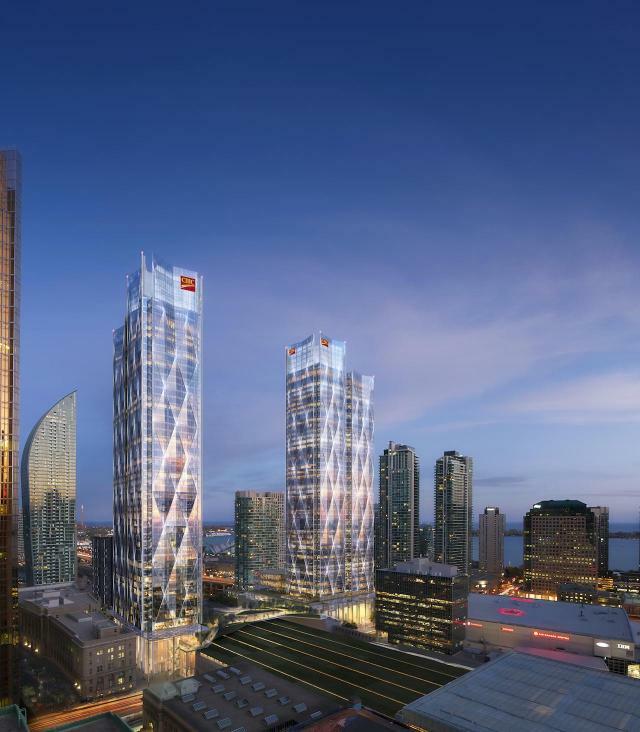 Hines serves as development manager for phase 1 at 81 Bay, a 49-storey, 1,300,000-square-foot office tower, and phase 2 at 141 bay, a 54-storey, 1,400,000-sqaure-foot office tower. The project will also include a retail podium and a three-story, below-grade parking garage, and bus terminal at street level, all designed by WilkinsonEyre Architects of London England, working with Adamson Associates Architects of Toronto. An elevated park will bridge over the rail corridor which separates phase 1 and 2, connecting them. The eight-acre site is located on the south edge of Downtown Toronto across the street from Union Station and the Scotiabank Arena, home of the Toronto Maple Leafs and Toronto Raptors. Engineering: RJC Engineers, The Mitchell Partnership Inc.